We are happy to invite you to a seminar with Barbara Szaniecki and Zoy Anastassakis from the Design Anthropology Laboratory (LaDA) of the School of Industrial Design at the University of the State of Rio de Janeiro, Brazil. Their visit is part of a newly established bilateral network activity between LaDA and the Codesign Research Centre (CODE) at KADK funded by the Danish Agency for Science Technology and Innovation. 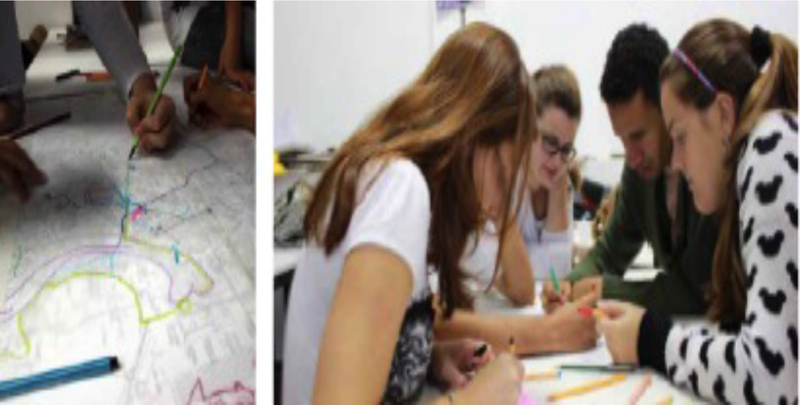 Both LaDA and CODE are involved in citizen participation projects for urban renewal employing codesign methodologies. As part of the network activity the involved faculty and doctoral and master students will get an opportunity to explore and compare how different forms of citizen participation are invoked by these methodologies across social and cultural differences. Conversation dispositifs facilitates communication with passerby + analysing by drawing. How has the design culture and the active practice of citizenship developed in Brazil and Denmark? How have the notions of engagement, participation, collaboration and community brought the worlds of citizenship and design together? In these two distant geographical contexts, how was design discipline formed, and in what ways has design been facilitating and/or dynamizing the processes of citizen participation? These are some of the questions we intend to discuss during this meeting; which brings together design researchers from Denmark and Brazil to explore the possibilities of applying the processes and procedures of collaborative design in service of the increase of citizenship in democratic contexts through news forms of participation. Students, teachers and passerby discuss the results exposed on the outside of Esdi walls. Barbara Szaniecki graduated in Visual Communication, from École Nationale Supérieure des Arts Décoratifs, Paris, France, (1994) and she has a master’s and PhD from Pontifícia Universidade Católica do Rio de Janeiro, Brazil (2005). Now she’s working in a Post-PhD research at the Post-Graduation Program, Superior School of Industrial Design, University of the State of Rio de Janeiro (PPDESDI/UERJ. In this institution, she is an associate researcher at design Anthropology Lab (LaDA). Szaniecki has experience in Graphic Design, acting on the following subjects: power, manifestations, representation and multitude. She has published articles and books. Zoy Anastassakis is adjunct professor, School of Industrial Design at the University of the State of Rio de Janeiro (ESDI/UERJ). Graduated in Design (ESDI/UERJ), MSc and PhD in Anthropology (PPGAS, National Museum/UFRJ). Coordinator of the Design Anthropology Lab (LaDA, partenership between ESDI/UERJ and IFCS/UFRJ), with support from FAPERJ. Representative of the Southeast Region in the Collegiate of Design, in the National Council for Cultural Policy of the Ministry of Culture. Anastassakis has extensive experience in research and innovation consultancy and strategic design, having worked as coordinator of research and projects in companies such MJV Technology and Innovation and Cria Global, working for clients like Coca-Cola Company, Bradesco, FINEP, Johnson & Johnson, Mapfre, Nestlé, Nokia, Omincom, Renault, Tim. She has published several articles in journals and books in the areas of design and anthropology, among them the collections “Anthropology and Cultural Heritage: trajectories and concepts”, published by the Brazilian Anthropology Association, and “Design and/is Cultural Heritage” launched by Carioca Design Center in 2012 with support from FAPERJ. Her PhD has received the Prize “Best non-published work in Design” from the Brazilian’s House Museum. In 2014, Anastassakis prepares the publication in book of her doctoral thesis entitled “Triumphs and Impasses: Lina Bo Bardi, Aloisio Magalhães and design in Brazil”. The book will be published by Lamparina Editions. Group of students working together to discuss the fieldwork perceptions. Two of the future visions developed by the students.